Ancient Egyptian "Wooden Mummy Mask"
The above listed item is from the Late Period,(715-332 B.C.E.). This "Wooden Mummy Mask" is carved from one piece of palm, acacia, sycamore or cedar wood. It has an earthen and mineral encrustation usually found on ancient Egytpian, wood carved, tomb relics. 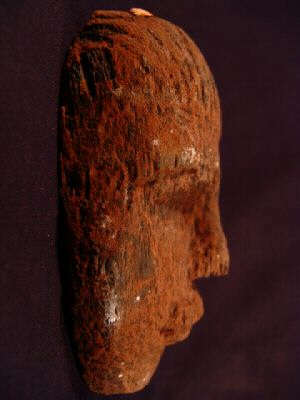 It has a nemes headdress, the facial features are very prominent and at one time, may have been painted. 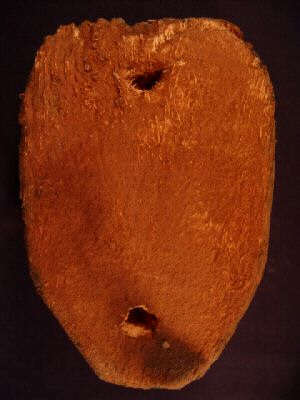 On reverse, there are holes where this mask was attached to the outside of the coffin. 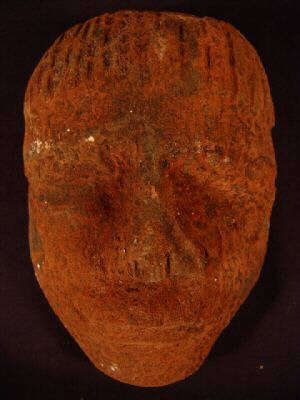 This piece is intact and is a lovely example of Late Period mummy masks! The reason for the item being available is due to the vast extent of archeological findings, thousands of years in Egyptian burials and also the proliferation of these said items in older private collections worldwide. Our company strives to provide our customers with the most interesting, unique and quality Egyptian artifacts! Our company spends a great deal of time researching and investing monies on private acquisitions to make these items available to you, at a low auction price. We continuously work at improving the quality and variety of our merchandise. We take pride in making your purchases exciting and gratifying!. You have nothing to lose so, Bid with the Utmost Confindence! ".